Innovation. There is a long list of Toko innovations such as the first fluorinated glide wax, first pure fluoro in block form, first to use Molybdenum which then everyone switched to (now we use something else: Diamond Like Carbon), first dedicated ski waxing iron, first "thermo bag", first copper brush which is pretty universally recognized as the best general purpose brush out there, and many more. In short, we have been THE innovators of the wax and tool industry for many years. Simplicity. We have fewer waxes. Why mix red and blue and call it purple? They are easy for people to mix themselves if necessary. To buy into the Toko line costs less (fewer waxes). The more simple line makes it far easier to learn the line and the nuances that make a big difference (When to mix XCold Powder with HF Blue or when and how to layer Nordic binder with straight grip wax). It is the same with kick wax and klister. Toko waxes are also designed to be broad ranged and always in there compared to other brands who have some products that are great, but in a very specific range. If something changes (sun comes up, hit some shade, it starts snowing, etc, you're screwed). 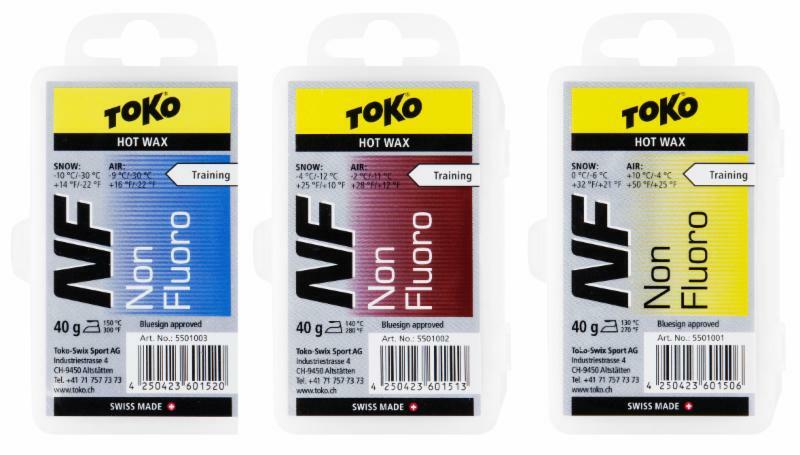 Toko offers 3 glide wax hardnesses (colors) in NF, LF, and HF plus a black wax. We have 4 kick waxes plus a binder and 3 klisters plus a binder. No compromise/performance. Our waxes regularly win Olympic, World Cup, and National championships. In testing, we are the best regularly and always in there. Service. On the TokoUS.com website, there is a well organized menu of "how-to" videos consisting of concise videos that cover the why and the how. These videos cover 9 different categories such as Alpine race waxing, Alpine recreational tuning, Nordic recreational waxing, tuning for Freestyle, and so on. If a person has a tuning question, he just needs email info@TokoUS.com and either I will answer the question or if the question is regional in nature, I will forward it to one of our 25 member technical team. For Nordic, there is no other company that does Nordic race wax tips like Toko which is surely why the other brands always wait for the Toko wax tips to come out before sending theirs out. We have a team of 25 technicians who are expert. Most have been doing Toko wax tips in their region for 15+ years and really know the weather tendencies and local weather phenomenons that occur. This is where our wax tips come from: local experienced experts who are right there and have been for many years. There is no other brand that provides service like Toko does in the US.